Cheri Fleming (left) and Dianne Curtis are Zonta's 2014 honorees. Photos by Michele E. Buttelman. Click to enlarge. 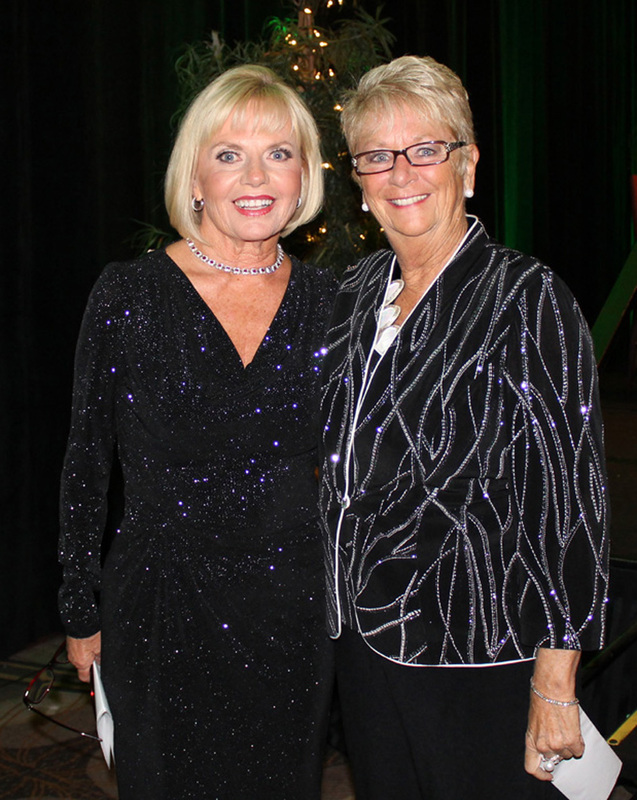 Dianne Curtis and Cheri Fleming were honored by the Zonta Club of Santa Clarita Valley during the 30th annual Zonta Celebrity Tribute Dinner on Nov. 7. 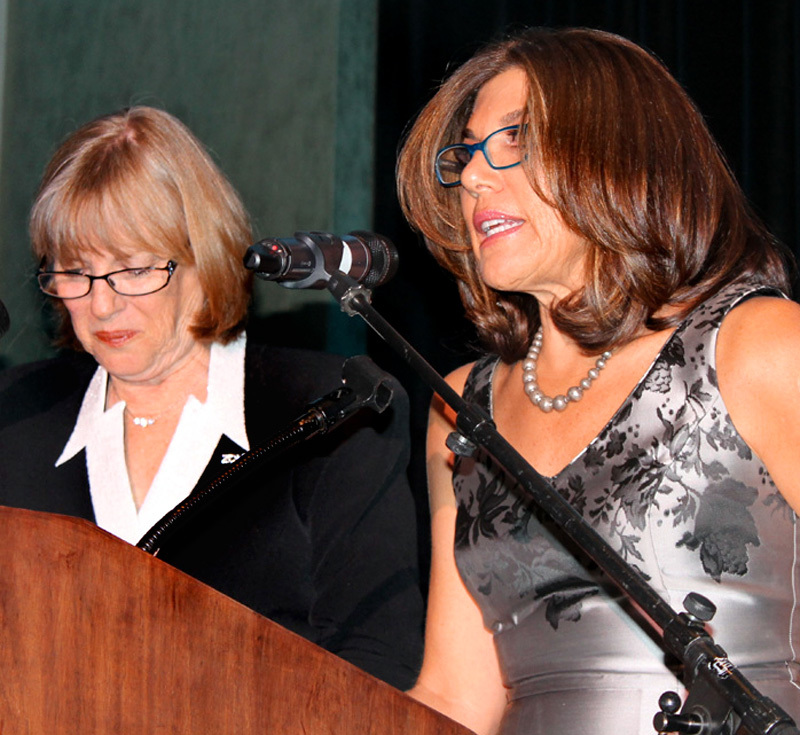 Curtis, past president of Zonta International, and Fleming, past president of Soroptimist International of the Americas, were feted during an evening of tributes and fundraising at the Hyatt Regency Valencia hotel. "It is truly amazing that two women from Santa Clarita have reached the highest position in their service organizations and led thousands of women across the globe," said Karen Maleck-Whiteley, president Zonta Club of SCV. "You can see how these two amazing women have truly impacted the lives of women and girls in this community and around the world. We are honored to be able to celebrate these women tonight." The theme of the evening was "local women, global impact." Both Curtis and Fleming have served as international presidents of two global women's organizations collectively involving more than 60,000 women in more than 2,500 clubs in 95 countries and geographic areas worldwide. Founded in 1919, Zonta International is a global organization of executives and professionals working together to advance the status of women through service and advocacy. Zonta International has more than 30,000 members belonging to more than 1,200 Zonta clubs in 67 countries and geographic areas. Soroptimist International of the Americas is one of four federations in Soroptimist International and comprises 28 regions with nearly 33,000 members in approximately 1,315 clubs in 20 countries. The name Soroptimist means "best for women." The organization was founded in 1921. Santa Clarita boasts two Soroptimist clubs: Soroptimist International of Santa Clarita Valley and Soroptimist International of Greater Santa Clarita Valley. Soroptimists in Santa Clarita support women's health and women in crisis and celebrate women. The clubs also participate in organization-wide programs including the Soroptimist Live Your Dream Awards, the Soroptimist Workplace Campaign to End Domestic Violence, the Soroptimist Violet Richardson Award and Soroptimists STOP Trafficking. Soroptimist also sponsors LiveYourDream.org, an online community empowering offline volunteer action. "Dianne Curtis and Cheri Fleming represent the very best of both of our organizations," said Nickie Bonner, governor of Zonta International District 9. 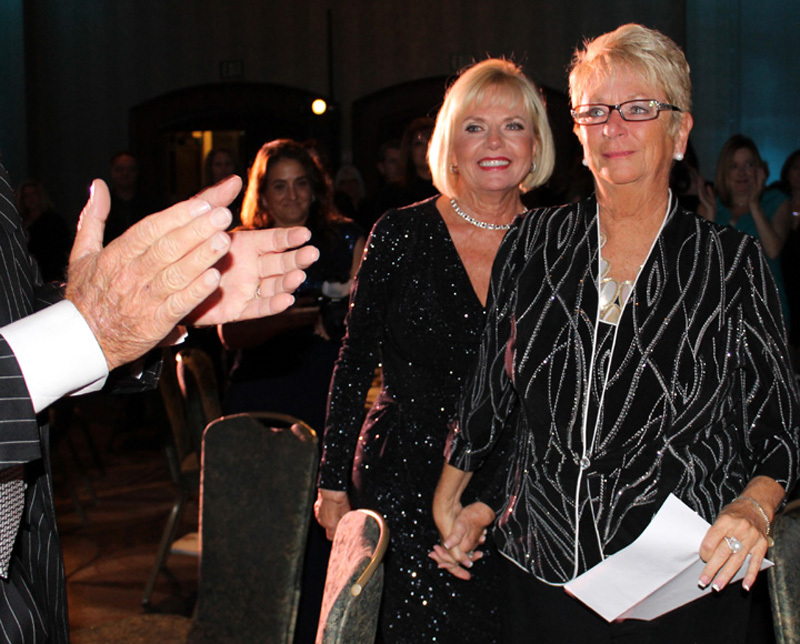 "What a special evening this is for Santa Clarita, for Soroptimist, for Zonta and for women." Dora Zavala, governor of Soroptimist International Camino Real Region, explained the goals and mission Soroptimist Internationals and also saluted Fleming's leadership. "Thank you to our beautiful Cheri, and her husband Don, for her service and their generosity," she said. "Thank you for all you've done for us." Lois Bauccio (left) and Vanessa Wilk tell of Dianne and Cheri's global adventures. Click to enlarge. Curtis and Fleming's international adventures, as well as personal tributes, were recounted by Lois Bauccio of the Zonta Club of SCV and Vanessa Wilk of Soroptimist International of Greater SCV. "The global accomplishments of (Curtis and Fleming) can't truly be put into words," said Bauccio. "It is quite amazing, when you stop to think about it, that these two organizations, with tens of thousands, perhaps 100,000 women in total, had, at one time, elected as the presidents of these two international organizations women who were from right here in the Santa Clarita Valley." Bauccio said Curtis was the first American woman to receive the prestigious Minerva Award. Established in 1983 by Anna Maria Mammoliti, president of Club II dellee Donne in Rome, Italy, the Minerva is awarded annually to "remarkable women" working in the fields of entrepreneurship and management, scientific research, arts, literary and social commitment. "We are very proud of her," Bauccio said. Bauccio recounted several personal stories about Curtis, including her passion for trucks and dancing and described her as a "truck driving ballerina." Wilk said it was an honor "to celebrate these two remarkable and accomplished women." "Cheri Fleming brought the passion, dedication and energy we know so well, to a global stage," Wilk said. "It was beyond amazing to watch." Wilk said on one trip to Asia Fleming said she had breakfast in Sapporo, Japan; lunch in Seoul, Korea; and dinner in Taipei, Taiwan. "That's one serious Asian buffet," Wilk said. The families of Curtis and Fleming offered touching tributes to the honorees. Dale and Jason Curtis, sons of Dianne Curtis, spoke fondly about their mother. "For some people it is about what they say, for others it is about what they do. For my mother, one moment she is the best mother and grandmother you can have," said Jason Curtis. "The next moment she is off to Ghana, Africa, to speak up for women and girls, whose voices aren't being heard. It doesn't matter if you are in Southern California, or halfway across the world, she is there for you. I think many of us would agree that she is somehow related to Superwoman." "There are a few moments in my life that stick out the most," said Dale Curtis. "Each one has left me a better person. I remember the first time (my mother) ran to become International President of Zonta. She didn't win, but that did not stop her. She doubled her efforts and won. I remember how proud I was to be standing next to her when she was installed as International President. I know it is cliché to say she has taught me never to give up, but her lesson that day was far deeper. I learned that your lesson in life is to find something you love, and never give up. It wasn't about winning that day, or leading an organization. It was about my mom's love of service to others." The brothers then invited the audience to raise their glasses and toast their mother, Dianne Curtis. Cheri Fleming and Dianne Curtis hold hands as they receive a standing ovation and walk to the stage. Click to enlarge. Don Fleming, who took the podium with son Brian Fleming, began his remarks with a few jokes. "My name is Mr. Cheri Fleming," he said, as the audience laughed. He continued with more jokes before saying, "I had more material, but I had to go through the Zonta censors." He then switched gears and spoke emotionally about his wife. "I am married to the love of my life," said Don Fleming. "She is a woman as gorgeous as she is smart." He compared meeting and marrying Cher as being as important to his life as breathing. "She is the yin to my yang, she is the wind beneath my wings, and is simply the most amazing woman I have ever known," he said. "She is one fabulous businesswoman, among her many strengths." Don Fleming also mentioned Cheri's 2006 Newsweek Magazine Dealer of the Year award. Cheri and Don Fleming are co-owners of Valencia Acura, but Cheri Fleming is the "dealer principal." "As you know, the auto business has long been a man's world, but Cheri came in number one over 11,000 other dealers in the United States," he said. Don also spoke about Cheri's long commitment to the nonprofits of the Santa Clarita Valley. "I've lost track of the number of Santa Clarita charities she has been involved with over the years," he said. "Like thousands of other successful, professional women, Cheri gladly pays it forward." As he spoke about Cheri's 30-year battle with rheumatoid arthritis, Don became visibly emotional. "She does not dwell on her illness and it does not keep her from living an incredible and active life," he said. "Much of it is spent doing for others. She has not shied away from talking about this illness." Don Fleming concluded his remarks by saluting the efforts of everyone who donates time and resources to making the world a better place. "Somewhere, in this valley and overseas, are people whose lives have been totally transformed by your caring and your service," he said. "Thank you for being their rays of hope and light in the darkness. Thank you for being their angels." As Dianne Curtis and Cheri Fleming held hands and took the stage, the audience gave the duo a standing ovation. Curtis and Fleming hugged each other and each offered up a few short remarks. "First and foremost I want to thank you, the community. You have given me the base to be a volunteer and to help others," said Curtis. "The spirit of charity and giving is an essential part of Zonta and this community." Curtis also thanked the Tribute committee, as well as her family, friends and speakers. Curtis then turned to Fleming. "You need not a book to recognize good leadership. It is the positive feeling you get just standing next to a person who holds that leadership, you and I share so much together," said Curtis. "It is an honor to share with you, Cheri, this stage and the world stage. I am honored to call you my friend." Fleming thanked Curtis for her remarks, and thanked the audience, as well as her family, friends and speakers. "I have to tell you how very grateful I am to live and work and volunteer in this truly awesome community. When Don and I moved here 18 years ago this community totally embraced us. That laid the groundwork so I could share what we have here, globally," she said. Fleming also spoke about the honor of leading a global organization. "I had a truly remarkable leadership journey and adventure this past year. But I also know, there is no place like home," she said. Fleming then turned to Curtis and concluded her remarks by thanking the Zonta Club of SCV for honoring her, alongside one of their own. "I am so privileged to be standing next to you (Curtis) tonight," Fleming said. "I respect you so much and it is so wonderful to have a friend who has shared the amazing adventures and journeys that we both have. I truly honor that very special friendship." A live fundraising auction led by Mark Drilling and assisted by Michael Lewis of the Stokes Auction Group raised more than $20,000 to benefit the philanthropic programs and scholarships of the Zonta Club of SCV. Proceeds from the event also included a silent auction, a tribute program book and sponsorships. Sarah Eaton and pianist Cassandra Nickols serenaded Curtis and Fleming during the event with a selection of standards that included: "Sisters," "Leaving on a Jet Plane," "Love Will Keep Us Together," "Friendship" and "Angels Among Us." Among previous Zonta Tribute Dinner honorees are Jeri Seratti-Goldman and Carl Goldman, Dianne Van Hook, Jack Shine, Jim Ventress, Bob Kellar, Mike Lebecki, Mike Berger, Duane Harte, Wayne Crawford, Jim Hicken, Shelley Hann and Marlee Lauffer. The event was founded in 1985 as a fundraiser to benefit the philanthropic programs of the Zonta Club of SCV. The Zonta Club of SCV is celebrating its 40th anniversary in Santa Clarita. The club is dedicated to improving the lives of women in Santa Clarita and around the world through service, advocacy and awareness. In Santa Clarita the Zonta Club offers a variety of scholarships and programs to assist women and girls including: monthly LifeForward workshops, the Domestic Violence Court Advocacy Program and the Virginia Wrage memorial Fund grants that support women starting over in mid-life. Additionally the Zonta Club of SCV supports the Santa Clarita Lego Robotics Team and international efforts to improve the lives of women around the globe. Event co-chairwoman Cheryl Wasserman and Laura Peckham-Troost were assisted by the Tribute committee which included Sharon Rodriguez, Pat Warford, Rosalind Wayman, Sydnee Davidson, Beth Heiserman, Michelle Woodfork, Pat Willett, Cindy Kittle, Marguerite Berg, Barbara Meyer, Norma Cardenas and Darleen Lyons.